We are avid gardeners so we like to grow our own veggies. What Chip, my gardening partner, and I have found, however, is as we- ahem-age, we need to find better methods of gardening. I don't mind crawling around on the ground to plant, but I have found that in the past couple of gardening seasons, I have become the old joke: as long as I'm on the ground, I look for other things to do down there before I get up! I prepare for my gardening session with the fervor of a four star general: tools in bucket: check. Knee pads securely fastened: check. Water bottle filled; gloves nearby; sun block applied: check. Okay, I'm going down. And so we have sought easier ways to garden. Last year, we planted pole beans instead of the bush green beans that we have planted for thirty-five years. They're just too hard to pick, whereas the pole beans just need to be plucked. We loosened the soil, stuck the bean seeds in, erected a temporary dog proof fence, and waited for germination. Chip lashed 6' dried pampas grass end-to-end and attached them to rough twine that ran vertically along our steel deck posts. The pole beans cooperatively grew two stories up the deck posts, clinging tenaciously to the grass/twine support. When the most tempting beans grew in no man's land, unreachable from the ground and potentially involving Beyoncé-type gyrations to pick from the upper deck, we solved the problem by simply sticking a ladder under the lower deck, hauling it out every few days. Having a gardening partner with 35" long arms helped enormously. Chip climbed the ladder and picked. I held the bowl. (She also serves who only stands and waits.) Harvesting seemed way easier than bush beans but Chip said it's a matter of perspective. The same rules for picking apply whether you plant pole or bush beans. If not picked consistently, the plant will stop bearing. Unlike bush beans, we noticed that the pole beans continued to produce well even when the weather turned hot. Since our decks face north, the east morning sun provided adequate light without the plants being exposed to withering southern afternoon sun, which I suspect kept the plants from being adversely affected. 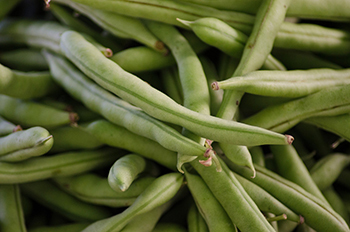 Some sources say that the pole beans are not as prolific as bush beans, and so recommend that planting bush beans if you plan to can is a better choice. We don't agree. We planted nine pole bean plants and found that we were able to have plenty for eating as well as canning. We don't mind canning small batches rather than conducting marathon all day canning sessions. Plus we still had some delicious Spurgeon Veggies green beans on the shelf, canned the year before, so we were able to take a year to experiment. The experiment was an unqualified success. We had plenty. We canned plain green beans, cut up for table use or soups and stews. The dill and fennel in our herb garden beckoned. We found a delicious recipe for dill beans and adapted it to use our fresh fennel as well. We found both to be delicious served hot or cold. They also provide a wonderful change from plain old green beans. Because they are canned whole, they make a nice presentation at the table as well. We found that nine plants really were way more than we needed for two people. The day we had green bean omelets, green beans for lunch, and tempura green beans for dinner caused a protest. We both are products of Depression era parents and find it impossible to waste food, but we had canned all that we could and eaten more than we wanted to eat. The neighbors were avoiding us and the dog even started sniffing disdainfully at his share of each meal. Perhaps nine plants were a bit much. This year we will plant pole beans again. It is easy on our backs, both the planting and the harvesting . Even the pole beans that got "beany" (grown a bit longer than they should have before harvesting) were tastier than beany bush beans. The plants are more resistant to disease since they grow away from soil, plus the insect damage was negligible compared to bush beans. We needed no pest management for the pole beans. It is way easier to weed and grow plants growing vertically than it is to maintain rows of bush beans. So ease of planting, maintaining, and harvesting of pole beans=winner. Just make sure you have a sturdy ladder and a long-armed gardening partner.